The key to this delicious and fun Summer Quinoa Salad is to blend a variety of colors and textures. You can substitute whatever you have on hand–get creative! Toss with our Maple Pecan Dressing, or another of your favorites. 1. Rinse 1 cup quinoa and bring to boil with 2 cups water. Simmer for 15-20 minutes. 1 cup dry quinoa yields about 3 cups cooked quinoa. (I recommend cooking more than you need and storing the extra in the fridge for other dishes over the next few days.) Cool. 2. Mix dressing 3. Chop veggies and fruits. If you don't have exact ingredients, substitute whatever you'd like. Organic chicken would also be nice in this salad. 4. 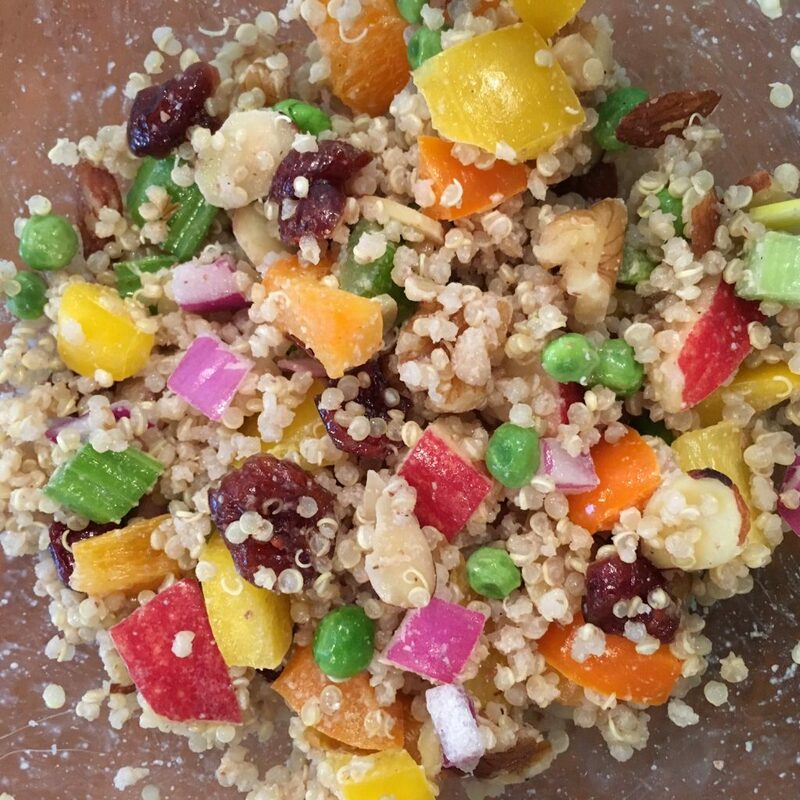 Mix quinoa, veggies, fruits, and dressing together in large bowl. I used minimal dressing for a light flavor. Feel free to add a bit more, if desired. 5. Serve as is or chill and then serve. store them electronically. It is such a relief to not have all the stuff to dust, move around, and take up space. I plan to share this letter with all my friends and family. Thanks for reading and commenting! Hope you are doing well!